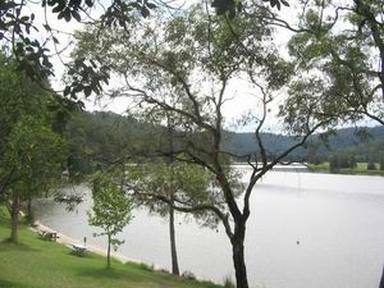 Leetsvale Caravan Park is a quiet, private park about 10km form Wisemans Ferry. It nestles in its own little valley fronting on to the Hawkesbury River. The property was bought in 1969 and the Park was established in 1975. It is run by the owner Gwen Hall and her son Graham. It provides an ideal escape from city life, for relaxation, water-skiing and other river activities, yet is within easy driving distance of Sydney, Richmond and the Central Coast. Although the property is quite large in area the number of sites is limited which ensures the Park remains uncrowded. There is a lagoon which was dug to encourage waterbirds and other wildlife and much of the property has remained undeveloped. Leetsvale has a boat-ramp and there are a number of boat sheds or undercover spaces available for rent by the site-holders. Laundry and drying facilities are available and there are separate male and female showers and toilets for campers or those who do not have en-suites in their vans. Powered and unpowered sites are available for campers.